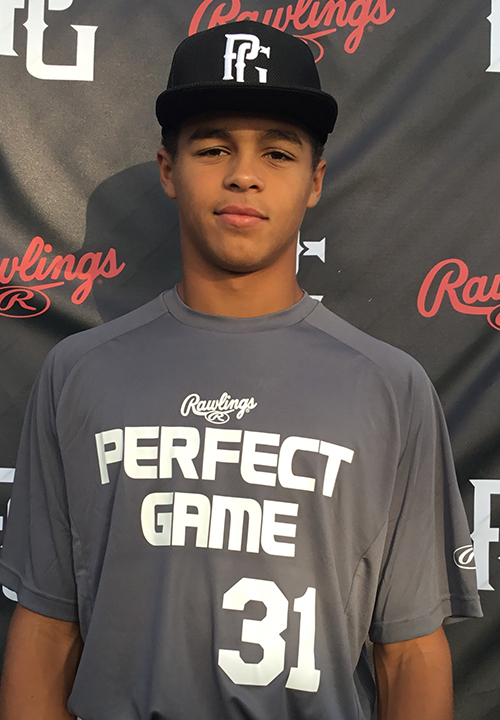 Andruw Jones is a 2022 OF/RHP, MIF with a 6-1 160 lb. frame from Suwanee, GA who attends Wesleyan. Tall and athletic frame with lots of projection still remaining. Ran a 7.05 second 60 yard dash, present quick-twitch athleticism. Primary outfielder, fields the baseball to the side and comes through it well leading into release, upright release with plenty of whip to arm, carry to throws with strength behind it topping out at 84 mph from the outfield. Secondary righthanded pitcher, begins windup with a side step up to a low leg lift with an extended front leg, full arm action up to a high ¾ slot, could get more from lower half for additional velocity, fastball has some angle and topped out at 82 mph, curveball has 11-to-5 shape and some tightness to the offering. Also took reps in the infield, moves to the baseball well with smooth hands and a quick release, arm plays really well with lots of carry to the first base bag, similar arm strength as in the outfield. Righthanded hitter, narrow base with a leg lift trigger, leaks onto front side with a flat bat path and some present bat speed, creates some pop off of the barrel when on time. Good student. Named to 2018 14U National Top Prospect List. Named to 2018 14U PG Select Baseball Festival.